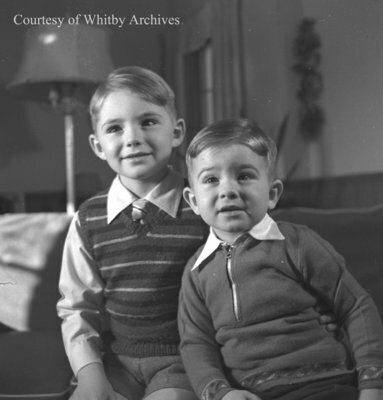 A black and white medium format negative of John and William Brant taken in December of 1944. In this view both boys are sitting. They are looking up and smiling. John and William Brant are the sons of Theodore Jack Brant (1905-1987) and Ruth Gladys Spall Brant (1909-1973). Theodore and Ruth had one daughter, Elizabeth Ruth. John and William Brant, December 1944, Marjorie Ruddy. Whitby Archives A2013_040_612.